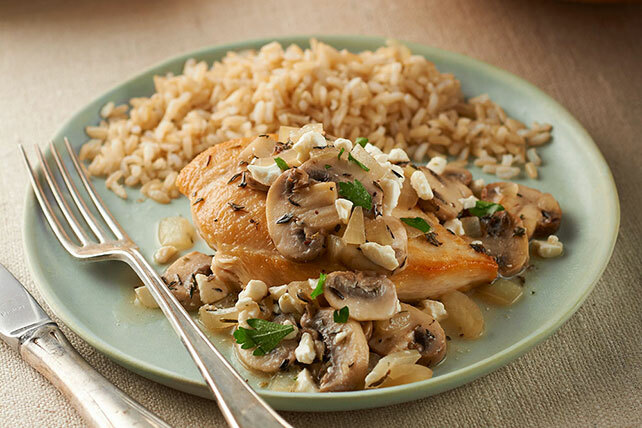 Make this Mediterranean Chicken and Mushroom Skillet in just 35 minutes. This Mediterranean Chicken and Mushroom Skillet is as fun to make as it to eat! Heat oil in large nonstick skillet on medium-high heat. Add chicken; cook 6 to 8 min. on each side or until done (165ºF). Remove chicken from skillet, reserving drippings in skillet; cover chicken to keep warm. Add mushrooms and onions to drippings; cook 10 min., stirring occasionally. Add broth, garlic and thyme; stir. Cook 5 min. ; stir in cheese. Top chicken with mushroom mixture and parsley.